What are the common issues with the wallet and transfers? I’ve transferring GRFT to the exchange hours ago and it doesn’t appear in my account yet. Some exchanges set a very high number of confirmations in order to avoid double spend on relatively low hash rate blockchains. This can lead to several hours before they consider the transaction as settled. Usually you can see the status of the settlement under the Deposit transaction list. Contact exchange for further support. Make sure you have enough funds left in your wallet to cover the network fee. If the balance hasn’t updated in a while (15-20 mins), try restarting your wallet. Keep in mind that first update takes longer than subsequent ones. Why did this project choose the name GRAFT? 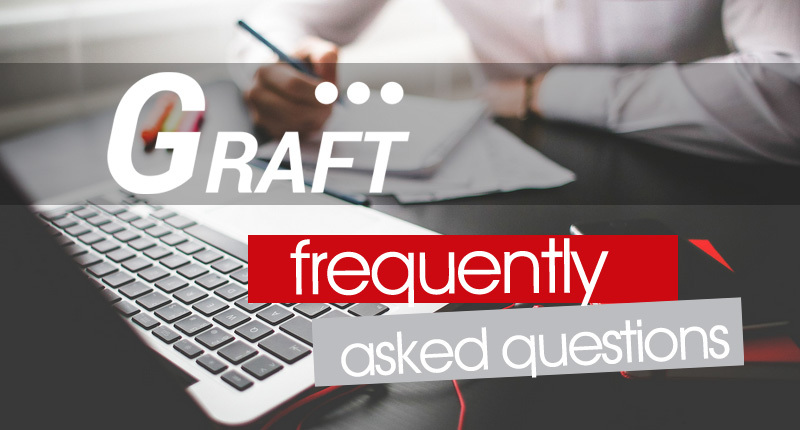 GRAFT is an acronym for Global, Real-Time, Authorizations and Funds Transfers. The word “graft” also means “a plant that has a twig or bud from another plant attached to it so they are joined and grow together”. GRAFT-ing is an advanced technique that botanist, farmers, gardeners, and hobbyist use to add living tissue from one plant to another. This technique allows for the best traits of different plants to come together to create something better and more valuable than their original plant. The GRAFT blockchain does something similar by bringing together many ideas, principles, and technologies introduced and tested by creators of other blockchains and combines them with newly developed solutions for transaction processing. What is unique about GRAFT? The most unique thing about Graft are its “SuperNodes” which earn rewards for authorizing transactions on the network. So essentially all the “fees” go back to Graft holders/ Network participants instead going to a centralized entity (eg Visa/MC/ Bitpay/ Paypal/ ETNpay etc). With Graft you are the network and get a proportional reward for all transactions on the network. Graft is a novel use case for Blockchain tech. Why Should People care about Decentralization and Privacy in Payments? Given the number of breaches happening on the ongoing basis is indicative of the problem in the space – it’s simply too lucrative of a target for the hackers to pass up. All the payment and personally identifiable information (PII) is aggregated and it’s being duplicated multiple times across the payment chain! That means that a hacker can hack any of the spots they chose and get a massive amount of user and payment data which they can in turn quickly sell to rogue players that will make use of that data. With the decentralized approach, the only party that sees (MINIMUM) data about the customer and purchase is the merchant themselves, drastically narrowing down hacking opportunities. What is the difference betwen a Full Supernode and a proxy Supernode? A full supernode (also called an RTA supernode) is a node that participates in the RTA mechanism: helping to approve and secure payments against double-spending. A proxy SN is the interface between end-user devices (like the mobile wallet, or POS terminals) that give a stable interface between those devices and the network, both to offload some of the processing power and allowing the mobile wallet and POS devices to not need an upgrade when mandatory blockchain upgrades happen; only the proxy SN needs an update. What are the collateral (staking) requirements for Full Supernodes, Proxy Supernodes & Exchange Brokers? Unlike full supernodes, proxy supernodes will still be operational and earn rewards even without a stake, however an unstaked proxy supernode won’t be able to earn rewards. This option is reserved for proprietary proxy supernodes, so the users with elevated privacy needs can host their own entry points to the network. Without the stake, the proxy supernode reward will be sent to the GRAFT community donation wallet address. This way the total transaction fee, which is assembled from several components, always remains consistent for the merchant regardless of status of the proxy supernode. Network participants wanting to earn proxy supernode rewards will require a minimum stake of 250,000 GRFT. Exchange brokers provide the real-time exchange services of various cryptocurrencies as well as fiat currencies on the network and require a minimum balance of 50,000 GRFT in order to qualify as an exchange broker. Exchange brokers are hosted on full supernodes so anyone wanting to provide exchange services will also need to own a full supernode or make a lease agreement with one or more full supernode owners. People often confuse between currency and payment system. Currency is Money. Payment System is a mechanism that allows currency to transact (change the owner). US dollar is currency. Euro is currency. US dollar bills and coins (cash, banknotes) are a payment system that enables face to face transactions. Visa and Mastercard are payment systems that enable non-cash, electronic transactions. PayPal is a payment system that allows to safely transact online. Bitcoin is native online currency (cryptocurrency, or simply crypto), with basic “built-in” payment system that allows to process Bitcoin transactions online. There are many other crypto in existence. The world doesn’t need another currency, but it needs a permissionless, secure, private, fast, and convenient payment system that would be able to process payments and transfers both online and in brick-and-mortar stores, in various currencies and cryptocurrencies. Only decentralized payment system can provide absolute privacy, highest security, and undiscriminating access to buyers and merchants. Not to mention the fact that only decentralized payment system can operate decentralized cryptocurrencies without reducing the value of their fundamental properties. How does untraceability work in GRAFT? As of today, CryptoNote is perhaps the only protocol that enables full privacy and untraceability. The beauty of Cryptonote is that it hides the details of transaction while still preventing double-spending. This is achieved through the use of key images. The key image is the unique “fingerprint” that represents the spending address and amount without disclosing any details about the buyer or the amount. By providing the key image for upcoming transaction to the network of supernodes, the buyer’s wallet will temporarily “lock” its “account”, so no other transaction with the same key image can happen until the “locked” transaction is settled or the lock is removed. If the buyer will try to finalize the transaction with the key image different from the one used in the original lock, such transaction will be rejected by the supernodes. On the other hand, the key image does not contain any information about the buyer or buyer’s wallet. In additional, any traces of communication between the buyer (wallet app), the merchant (point of sale app), and the supernodes (selected relay and sample supernodes) during authorization phases are completely removed once transaction is settled (written into the blockchain). Ripple does not provide the privacy and untraceability that are demanded today by potential Graft users – both buyers and merchants. When we pay with credit card, we share our secret payment information (like credit card number) with some entities – the merchant, the issuing bank, the payment processor, the payment acquiring bank – but those entities are relatively trustable so they try not to share our secrets with the entire world, and no one else can see our transaction history without our or their permission. Oftentimes, however, they fail to keep our secrets (think Target and many other retail mega breaches). With Ripple or Bitcoin or most other cryptocurrencies that are not based on CryptoNote protocol, the story is exactly opposite: there is no central authority that “knows” our secret “card number” (private key), but at the same time anyone in the world can trace our payments on the blockchain and link them to our identities with minimum efforts. By Implementing CryptoNote and other features, Graft brings the level of untraceability of payment history similar to traditional credit and debit card system, while adding decentralization, privacy, and security, which are the features of any cryptocurrency that are absolutely impossible to achieve using traditional credit card payment technology. Graft mobile wallet and point of sale do not contain the full copy of the blockchain for obvious reasons. Does it mean the wallet content is stored on supernodes which may compromise its security and privacy? In Graft, the Private spend key is always stored at the client (wallet) and never shared with the supernodes. Therefore, it is not the same as credit card when you share you card account number with the merchant, payment processor, and the bank every time you make a payment. If one of them is breached, you credit card can be stolen and used to make fraudulent payments. If any or even all supernodes are “breached”, they don’t have your private spend key so no one will be able to “use” your Graft account. The Graft wallet balance is a “hidden” set of previous transactions. It is calculated by scanning all the previous transactions which are stored on the public blockchain but invisible without view key. Since mobile wallet app does not have direct access to the blockchain, the private view key is temporary shared with a single relay supernode in order to retrieve the wallet balance; the supernode will not store this view key in any database so even if it’s “breached” the view key will not be disclosed in most cases. However, even if the view key is disclosed, it only allows to see transactions, not to spend any money. Users (either buyers or merchants) with higher requirements for privacy can host their own private supernode with full copy of blockchain. This way they will never share their view keys with the random “foreign” supernodes. Most probably, due to limited processing power and other resource limitations, such a private supernode will not be able to participate in transaction processing and earn any rewards or transaction fees, but it will still be able to validate transactions and view balances privately by scanning the local copy of the blockchain. For users who cannot or don’t want to host their own supernode but still don’t trust the entire network, Graft creates a special (free) cloud service with trusted supernodes that are protected by multiple levels of security. There are several major differences between Graft and Dash, but all of them are focused on the Graft’s mission to be as close as possible to the “real world” of retail, hospitality, gas stations, convenience store, or restaurant payments. Dash’s InstandSend is an optional feature, which is implemented on top of the blockchain network protocol as a 2nd application tier. Therefore, Dash transaction can be processed in two ways: InstantSend authorization or “regular” send. If InstantSend fails for any reason, transaction is sent through the regular slow path. Such a scheme is not acceptable in the “real world” of payments. In order to “compete” with the dominance of credit cards, crypto payments must be always approved instantly. Unlike Dash, Graft real time authorization is a built-in feature: all Graft transactions are approved in real time, within a range between several milliseconds to a few seconds, depending on the merchant settings. Thus, both online and brick-and-mortar merchants and their customers can always rely on Graft real time authorization. The buyer is required to pay an additional fee in order to process the payment faster using InstantSend. Graft transaction is always approved in real time, and such approval does not require any additional fee. A small symbolic flat fee is paid by the merchant (similar to the credit card fee in the “real world” but significantly lower), which enables an an adoption of Graft for micropayments. Like in the world of traditional payments with credit and debit cards, the buyer (sender) does not care about the fee rate or complexity of the fee structure, which allows much higher conversion rates and better buying experience. Dash has another optional feature called PrivateSend which also requires additional configuration efforts and extra fees from the sender (buyer). Unlike Dash, which is based on Bitcoin code, Graft is based on CryptoNote protocol and Monero code, which provides incomparably higher level of privacy, untraceability, and unlinkability of transactions, right “out of the box”, without any additional actions or fees required from either buyer or merchant. Thus, each payment on Graft blockchain is “visible” only to the buyer and merchant involved in this particular payment, just like in the real world of credit card payments, or in fact even better as there is no central authority in between. Unlike Dash, which is mainly a cryptocurrency with some optional features, Graft is an open payment platform that allows merchants to accept various methods of payments such as other cryptocurrencies and credit/debit cards. Different merchant payout options in altcoins of local fiat currencies will be also available through Graft point of sale app and Graft service brokers. Graft wallet users can also instantly exchange other cryptocurrencies or fiat currencies as part of the payment transaction. Graft payment processing flows and transaction types are atypical for cryptocurrencies but very usual for the brick-and-mortar and ecommerce merchants; those flows have been designed to allow an easier adoption by the mainstream merchants and consumers, without the need for any centralized intermediaries (payment processors) which defeat the basic principle of cryptocurrencies – decentralization. Unlike other cryptocurrencies that provide a single wallet app, which is typically used for both sending and receiving payments, Graft separates those functions, just like in the “real world”, between buyer’s wallet app and merchant’s point of sale app. So the users with different interests will never be confused by the “opposite” features they never use, such as top up in the wallet or payout in the point of sale. How is GRAFT different from PundiX? PundiX project claims to have a working POS terminal that can accept cryptocurrency as a payment or allow someone to buy cryptocurrency with fiat. how does the terminal validate the transactions? How did they solve the blockchain speed problem? There’s no code published on github or available for download so it’s impossible to assess the auhtenticity of PundiX’s claims. Outside of lack of details on their solution, there’s a big difference in approaches – PundiX is building a point of sale terminal, while GRAFT is building the payment network and an ecosystem of service brokers that can be integrated with any point of sale system via standard payment terminals. 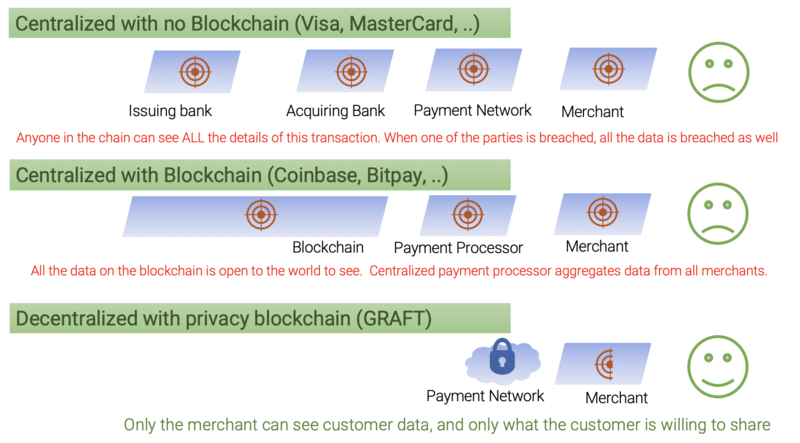 A payment network like GRAFT takes care of separating the merchant from the currency conversions and addresses the speed of transactions, fee structure, and transaction privacy. Traditional credit and debit cards are accepted by service brokers which are hosted by Graft supernodes as network “plugins”. The supernode network is fully decentralized organization. The service broker, including credit card acceptance broker, is a distributed gateway which has an owner who complies with all necessary regulations. In addition to default “reference” implementation of credit card acceptance broker created and maintained by Graft Foundation, there will be multiple third party implementations that offer similar competitive services. Thus, technically, a single credit card acceptance broker is not fully decentralized service but it is running on decentralized, distributed, and diverse service platform.In addition to traditional credit and debit cards, Graft is designing and implementing its own crowdfunded credit card eco-system which will be fully decentralized. Graft resolves the first problem by logical separation between payment and transfer, so supernodes (miners) receive transaction fees for instant payments which constitute the majority of all transactions, while free transfers are processed “on the background” with lower priority. The second problem with DOS threat is resolved by voluntary user identification and authentication. Of course, there are no free lunches, so the users should “pay” by providing their identity to the network to ensure the reasonable use (by limiting the number and frequency of free transfers per user) and prevent the network abuse. However, using zero knowledge proof authentication technology will allow users to prove their identity without compromising their privacy. The last problem with uncontrolled block size growth is resolved by a complex of measures: small block interval, unlimited block size, and standard restricted transaction size for particular transaction types such as free transfer. In addition, one of the sides of the free transfer must prove that they contributed to the network by conducting “commercial” payment transaction types in the past. Yes and no. They are competitors just to the single feature of Graft blockchain – spending debit card – which is just one of the ways Graft is going to enter the mainstream payments. We think about both sides of typical payment transaction: buyer and merchant. Tenx only cares about the buyer, which is definitely important. But what about merchants who want to accept both traditional payments (such as credit/debit cards including tenx) and cryptocurrencies? In order to do that, today merchants must maintain multiple point of sale, payment terminals, and wallet apps which is very impractical. Graft point of sale app accepts both cards and crypto, and convert payouts (payments for proceeds from purchases) to local fiat currency if needed. Another important point – Graft CryptoNote-based blockchain is absolutely private: sender address, recipient address, and transaction amount are encrypted on blockchain and therefore hidden from public view. On top of that, Graft adds private transaction fees which are visible to blockchain reviewers in all existing CryptoNote implementations. What is the difference between the Unlocked and Locked wallet balances? How long will my coins remain under Locked balance for? “Unlocked Balance” is the amount of GRFT a user has available for immediate use. “Locked Balance” is the amount of GRFT that is currently on hold and awaiting confirmations. The GRFT held in your “locked balance” will be moved to your “unlocked balance” once the transaction has received a total of 10 confirmations on blockchain which takes approximately 20 minutes. What is the utility of and who should buy GRFT coin? Users might want GRFT coins as a purchase currency so they don’t have to incur high network fees on other digital assets where the fees are network rather than transaction amount dependent. Where does GRAFT see itself in 5 years? In 5 years we hope to see GRAFT become the 3rd most popular payment network after Visa and Mastercard. No reliance on banks, transactions are kept private and secure on the blockchain, true cross-border payments, built-in loyalty programs, no hidden “got you” fees that banks charge, better chargeback handling for merchants, democratized credit for users, and much more.